Booking is CLOSED for 2019 & 2020. Thank you. Blog Badges * Please scroll down to see selections. AuroraWings prefers to avoid imposing rules or requirements such as 'your blog has to be at least this many years old', 'your blog needs to have a minimum of certain number of followers', or 'need to have large number of participants'. The only thing Mitzi would like to ask is that you have AuroraWings as the sole sponsor* of your challenge for which she is providing the images and the prize(s) if it is your regularly scheduled challenge and not a special event such as a blog's anniversary (in which case you may be looking for a large number of sponsors). * Exception to this rule is when a co-sponsor is a non-digi company/designer, as in the case of a physical products manufacturer, such as embellishments. To request and book sponsorship for your challenge, please use the Contact form. No reply will be sent to sponsorship requests sent via Etsy convo or Facebook messages. Once the dates are confirmed, it is the responsibility of the person in charge of the challenge blog/DT coordinator to request images/digi files in time for the scheduled event by contacting Mitzi. 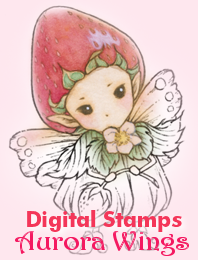 Please send a list of links (URLs copied and pasted from the browser navigation bar) of the digi listings from her shop for easiest identification of the digital stamps. Many listings have similar titles since many are descriptions rather than the original titles, so please avoid using just the titles on your list. Reply will be made within 24 to 48 hours except for during major US holidays. To request digis for your scheduled and confirmed challenge, send e-mail to studiomiyabi@aol.com. The requested digi's for the DT will be sent to a person in charge in a single e-mail. Distribution of the files to the respective members is a responsibility of person in charge of event coordination. Please understand that AuroraWings cannot send out separate files to a list of e-mail addresses due to time constraints. Mitzi would greatly appreciate all challenge blog owners and DT members respecting the rights of all digi designers by not sharing files beyond what they were originally specified for. Thank you so much. Please have the winner(s) of your challenge contact Mitzi at studiomiyabi@aol.com with the subject line "Winner of [name of your challenge blog]" with a list of links (URLs copied and pasted from browser's navigation bar) to the digi listings from AW Etsy shop they wish to receive. Prize files will be sent directly to the winner(s) in response. Prize amount is in US Dollars. If your winner is from outside of the US, please have them use the 'currency converter' found at the bottom of all Etsy pages. Make sure your digis total no more than $10 USD. Overage of any amount will not be accepted. 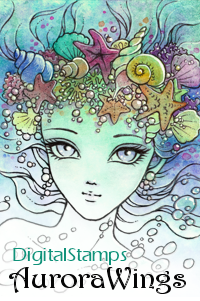 Invitation to FB Group "Stamps by AuroraWings"
You and your DT members are invited to join AuroraWings' Facebook group "Stamps by AuroraWings" where members can post photos of their projects & blog links, participate in monthly contests to win prizes, and more. Free digi's are also a part of the membership perks. Join today! 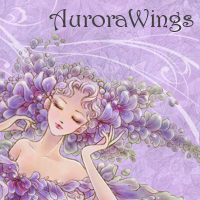 Invitation to Our Challenge Blog "Aurora Wings Challenge"
Everyone is also invited to follow "Aurora Wings Challenge Blog". We are a monthly challenge blog with new challenge coming on the 3rd Monday of each month. This, along with the monthly contest that goes on at the FB group, will give you bi-monthly opportunity to participate in a challenge. 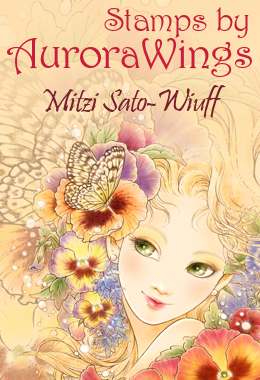 Mitzi is a Colorado-based fantasy artist. Originally from Japan, her art is influenced by the vintage shojo manga she grew up with, as well as the classic art forms such as tattoo art and woodblock prints of her native country. Her fantasy art subjects range from cute and whimsical to dark and macabre, and everything in between. 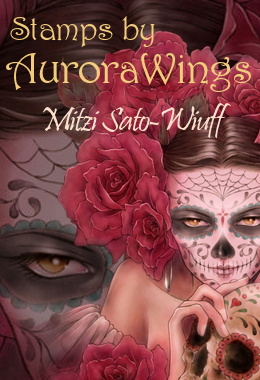 Majority of her Aurora Wings digital stamps are made from the line art of her fantasy illustrations, giving them a uniquely distinct look of flowing lines with high level of detail. Most are ink & pen traditional drawings, which are either colored free-hand in Corel Painter or traditionally with watercolor. 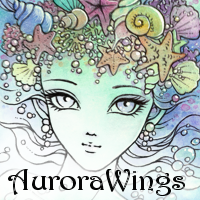 Her Etsy shop, Aurora Wings, offers digital stamps, prints, ACEOs, coloring books, and originals. For challenge blogs and personal blogs, if you enjoy crafting with AuroraWings digital stamps, feel free to show off your love by putting any one of these blog badges available below. Just right click and save. Linking either http://www.aurorawings.com/ or http://www.etsy.com/shop/AuroraWings would be most appreciated. Thank you. Please feel free to size down when necessary to fit your blog layout. Sizing up beyond the original dimensions (=enlarging) is not recommended as there will be a noticeable decrease in image quality.